Cafe24 Review 2019: Is Cafe24 a Good Hosting? Cafe24 is one of the largest e-commerce hosting platforms in the world. They cater mainly to Korean businesses empowering regular online store owners. They target the Filipino, Chinese, U.S., Japanese, and Taiwanese markets. Since their founding in 1999, Cafe24 has grown rapidly and now employ almost a thousand staff. The platform now hosts over 1.5 million Korean e-shops. They have eight internationally-oriented websites in each country’s local language. Cafe24 is essentially a full-service web hosting platform: not only do they help you host your e-commerce website, but they can also help you build, launch, market, and even operate your online store. Plus, being a part of the Cafe24 community gives you access to their SOHO business center and education center, which means you can attend all of their special lectures on topics such as entrepreneurship, SEO, photography, and marketing. These features are likely why Cafe24 is the go-to provider for some of the most popular Korean e-stores. Their hosting plans are fairly straightforward, although by no means are they simple. You choose a plan based on the current size of your online store: if you’ve only got a small website at this point, you can opt for their entry-level Economy 10Gbps Optical Full SSD hosting plan. This is an extremely lightweight plan that starts you off with 400MB SSD storage, 1.4GB bandwidth, three POP3 email accounts, and a single hosted domain. Their plans go all the way up to 14GB SSD storage, 500GB bandwidth, 50 POP3 email accounts, and up to 20 hosted domains. Cafe24’s services also include image-only hosting plans, JSP hosting, website builder packages, database hosting, Windows hosting, and WordPress hosting. And it doesn’t stop there – you can also go for the more typical VPS hosting and dedicated server hosting if your website demands the highest levels of performance. The e-commerce hosting giant has formed partnerships with multiple online marketplaces including Amazon, Alibaba, Lazada, Rakuten, and Mogujie. This affords their Korean customer base a much greater ability to sell their products around the world. It’s unclear whether Cafe24 has an uptime guarantee or any form of SLAs, to be honest, that could be attributable to the fact that their website is entirely in Korean. If you speak the language, you should have no issue finding the relevant information – but non-Koreans may have much more difficulty using their services. Cafe24 has a huge range of services, so they can cater to a wide variety of customers. Whether you have a tiny online store selling only a few products or a massive e-commerce business with thousands of products, they’ll definitely have a price range that works for you. They do charge a setup fee for all their hosting plans, however, most providers I’ve seen will waive this fee, so it’s surprising that Cafe24 has chosen not to. Cafe24 doesn’t have any free trials or free versions of their hosting packages. They also do not appear to have a money back guarantee, though they’ve gained a solid reputation in Korea, so that should stand as a testament to the quality of their service. Moving between plans is definitely possible, but will require you to call their customer support. All of their customer support personnel speak Korean, so you’ll have to be able to communicate in the native language if you want any form of assistance. Similarly, their support documentation and training seminars, while extensive, are all in Korean. You can contact their support via email, fax, or telephone (only during regular office hours). With their ever-evolving e-commerce platform and thriving community of entrepreneurs, Cafe24 will likely remain as one of the top online shop hosting providers in Korea for years to come. 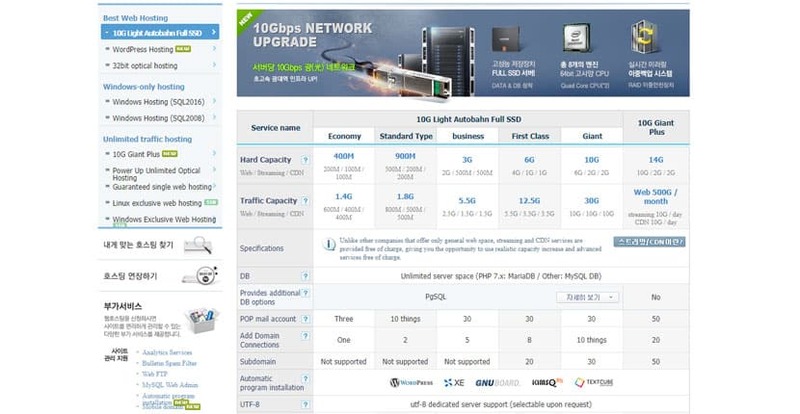 However, their platform isn’t very accessible to non-Korean web hosting customers at this point. Wondering how Cafe24 stacks up against other Web Hosting companies? Enter any other Web Hosting company and we will give you a side-by-side comparison.